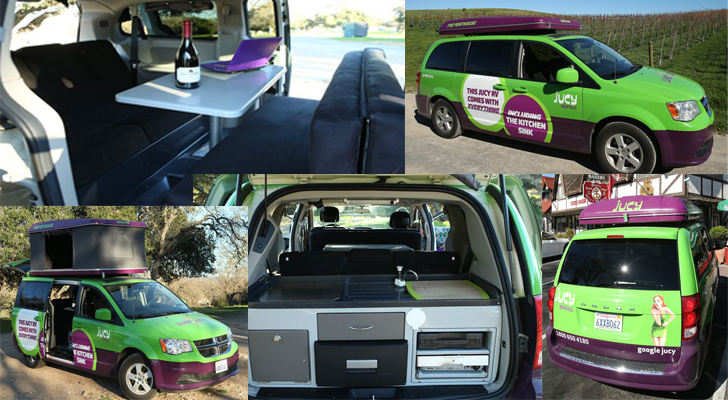 RV Owners are replacing their TV's with LCD / LED at a rapid pace. Then comes the fun part which is installation through the use of a RV TV mount. If you’ve got an older RV, you know the trouble with mounting newer style LCD or LED TVs in your rig. RVs from about the year 2000 and earlier simply weren’t designed to accommodate the newer flat-panel television that we’ve all come to love. Those older RVs usually have weak mounting brackets that lack the hardware to hang flat-panel TVs. Many RVers simply don’t take into consideration how they’re going to hang a new RV in their rig. They focus more on the purchase of the TV, and totally forget about where – or whether – it will fit in their rig. That’s unfortunate, because there are literally hundreds of different mounts for RV TVs, and each has a pros and cons. What’s worse – some TV mounts simply won’t work in an RV due to size or required mounting hardware. This RV TV Mount Simple Guide is aiming to do one thing only: get you up to speed on the different RV TV mounts available for your purchase. 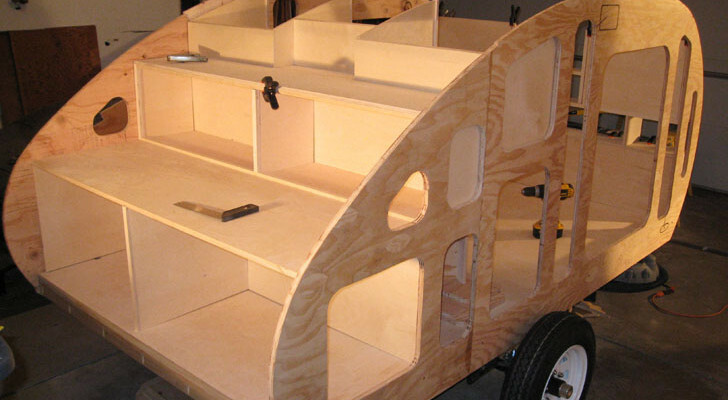 Be sure to also see our RV TV Mount Installation Article if you are looking for idea on how to install your new mount. Flat TV wall mounts or flush TV mounts are perfect for achieving a low profile, simple, and stylish look. These simple TV mounts fix your television against a wall just like you would hang a picture or mirror to the wall. People gravitate toward this type of mount because of their relatively easy installation process and the stylish appearance. This type of mount is great for RV’s because space is at a premium and flat mounts keep TV’s tucked snug against the cabinet or wall. Flat TV wall mounts are meant to sit flush against the wall so they do not offer any range of motion, meaning that they do not rotate or tilt. Once your TV mount is installed, you won’t be able to adjust or tilt its position without re-installing it. This variation of TV mount offers about one to two inches of space between the wall and the TV so you have to keep in mind that you may have to remove the TV mount from the wall in order to access wires connected to the back of your TV (ways around this). The brother to the flat mount is the Tilt Capable TV mount. 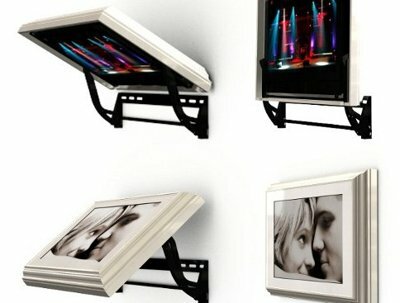 They are similar to fixed mounts but offer the ability to tilt your TV once it has been mounted on the wall. Many times you can achieve an ultra-slim look but with the added benefit of tilting your TV to achieve an optimum viewing angle. These mounts tend to be more expensive than their flat mount brothers. The tilt mount can be a huge feature for RV’s as glare can cause the TV to become unusable at certain times. A tilt up or down can totally relieve the frustration of glare ruining a movie or show. Since tilt TV mounts allow the TV to be tilted downwards, they are perfect for mounting TVs at positions that are situated higher than eye-level as you will find in a majority of RV’s. Most Tilt Mounts tilt between 8 and 20 degrees, though it doesnt sound like much it can make a huge improvement. 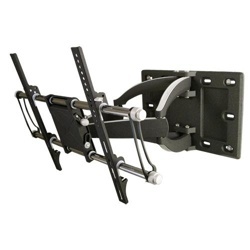 Articulating TV wall mounts are one of the most popular Motion enabled mounts. They feature the ability to sit snug against the wall, extend outward up to 30 inces on some models, and shift the TV from side to side. The added benefit of an articulating wall mount is that it also allows you to turn your TVs tilt to the left or to the right. 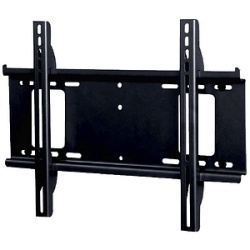 You will find this type of TV mount has a slightly higher price tag than the Flat Wall Mounts. The arm folds back so the TV can be close to the wall when not in use. Because this type can move the TV several inches out from the wall, it allows a wider range of side-to-side swivel. The Articulating Mount is popular for RV’s because it allows for the TV mount to be installed virtually anywhere as it requires very little area for securing to a wall or cabinet. 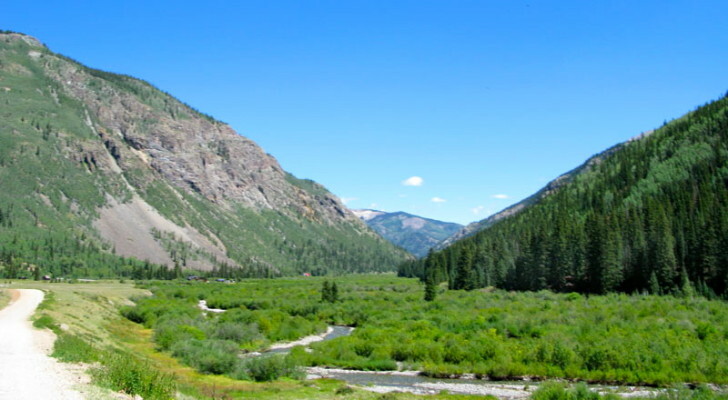 It also allows for enjoyment of the television from mutiple viewing angles in your RV. The only downside to this mount is it wont sit as flush to the wall as the Flat Mounts, it doesnt allow for tilting downward for improved viewing angle, and it will also need to be restrained while in transit. 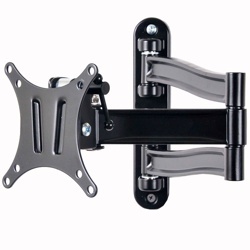 The Full Motion Mount offers the most flexibility among TV wall mounts. You can angle the tilt, move it left and right, and in some cases move the TV 360 degrees in a circle. This means your able to watch your TV from several areas and even other rooms in your RV. The price point for this wall mount is at the high end due to the additional parts and engineering involved in making these units so flexible. The Full Motion Mounts go by other names such as retractable TV mounts, tilt/swivel mounts, and sometimes even articulating TV mounts. 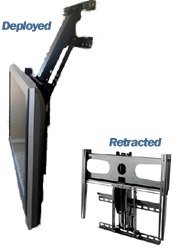 Full-motion TV mounts offer an even greater level of flexibility than articulating mounts because they allow you to tilt(up and down), swivel(side to side) and retract your television for maximum adjust ability. Fans of this type of TV mount enjoy being able to see the screen from virtually anywhere they can get an eye shot. Choosing a full-motion TV mount means that you are less limited in where you choose to mount your TV. The downside to this type of RV TV Mount is the price will be higher than the others listed above, it will not sit as flush to the wall, and it will also need to be restrained during transit. 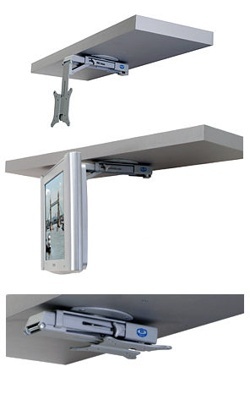 Under cabinet mounts allow you to mount a small TV for use under your cabinet in your RV. They are great for mounting 10” to 24” (sometimes larger)TVs in any room with a cabinet such as the kitchen, overhead storage, or any other overhead surface. The under cabinet TV mount will keep a flat panel TV neatly tucked away under your RV cabinet. You can find these mounts with a fold up design (pictured) or a stationary permanent design that does not have the fold up functionality. With these types of mounts, you get the flexibility to watch TV in a small area without sacrificing much space. This is because the under cabinet mount gives you the added benefit of hiding your TV under the cabinet overhang, allowing for access to your counter top when you need to free up some space. Since many under cabinet mounts can be rotated or tilted, you will find an optimal viewing angle not that difficult to find. Downside to Under Cabinet RV TV Mounts is they do not support larger screen TV’s and it may be difficult to get the required cables ran to your TV for satellite, power, DVD, etc. The newcomer to the RV TV Mount space is the Pull Down Motion Mount. 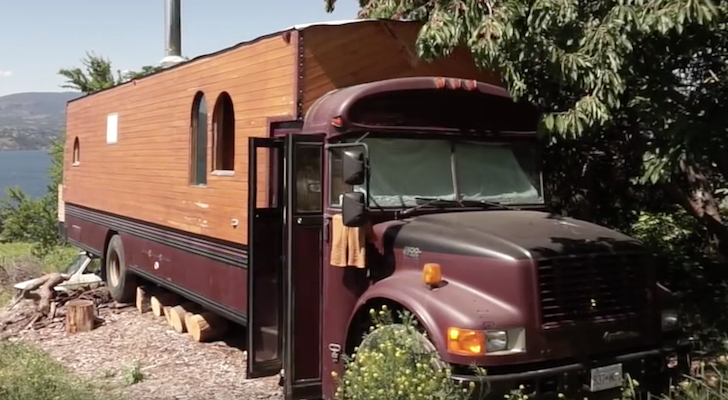 Many RV’ers have been clamoring for functionality like this for years with limited options. Now your TV that is mounted overhead in your RV can be fixed as it always has been above your line of sight or pulled down 20 inches or more to a more comfortable viewing angle then without much effort returned to the cubby from which it came. 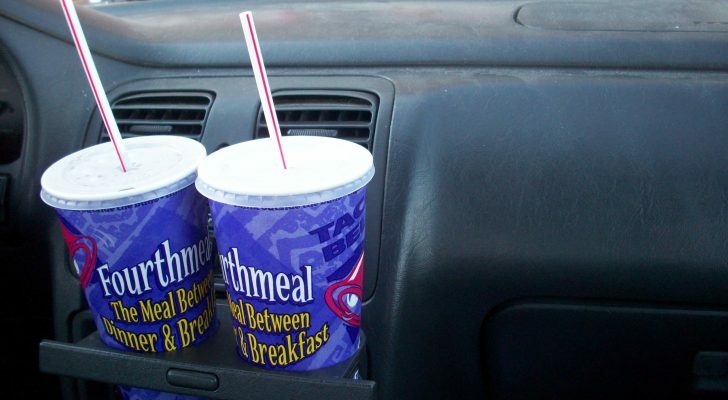 These are ideal for many RV applications. Given the gas springs that are necessary to make these units function and the quality of the mount necessary to hold a tv suspended from a surface, these units are far from cheap. Downside to these types of mounts are mainly price. There are not many that come in under $200. They also tend to have a larger footprint that other mounts and require more space for securing it to a surface. If you happen to have the room for the Hidden Vision TV mount and the budget for one of these mounts its by far one of the most amazing and eye catching designs on the market today. 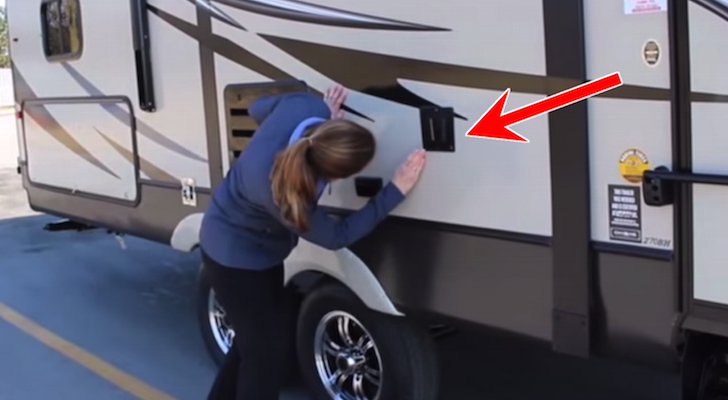 The mounts are priced at $500+ but you would have your fellow RV’ers jaws dropping over this RV accessory. Hopefully you now have some direction on what to look for and which type mount you think will work best in your RV. Be sure to look over the RV TV Mount Installation Ideas and Resource Article regarding how to install these mounts given the specialty application inside a RV is rarely the same as in a home. If you have questions on how to install any of these options or which to choose feel free to ask a question in the comments. Wow, I’m sure he’s going to be thrilled with all the effort you’re putting into his work area! Another option is to run an HDMI cable from the TV to his laptop. You might find using the TV as a computer display less cumbersome than installing monitors. About to take delivery of our first motorhome. 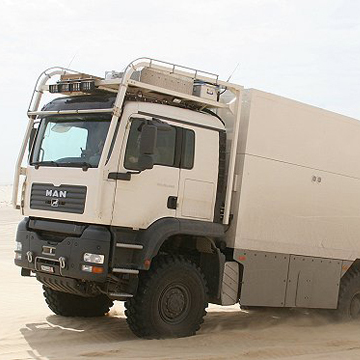 (2014 Forest River Charleston Class A Diesel with Co-Axles) I want to try to customize a computer work station in the kitchen boot dinette area in time for my husband for Father’s Day. He is a computer/internet guy, and is going to be working during travels coming up. He uses two 20 inch monitors at home on his desk, and I am looking for a good solution for him on the road. I have already gotten him a wireless printer/scanner that will be space efficient and work well for his needs. My biggest concern is space and the ability to either fold up or remove the monitor stands from the table area that he will use as a work station. Mounting something permanent to the table is out- it converts to bedding. And I am not sure if the removable mounts are sturdy enough for the monitors during transit. I have looked at the wall mounts that retract, but a little unsure if this is something I could install without causing damage to the motor home walls. I would not be against mounting under cabinets bc the monitors are thin and very light weight. Any pointers or products you could recommend? Any advice would be great- trying to make sure he is comfortable and surprised that I would even take the time to try to figure this out for him! I hope this answers your question. If not, please post a reply here or in the RV forum. Is there a difference between a regular TV mount and an RV TV mount? He has the smaller old square TV cabinet with the flat metal roll out shelf that comes out and can then be swiveled left of right. I think he is looking for a mount that can be attached to the flat metal roll out shelf that is already there in the cabinet. 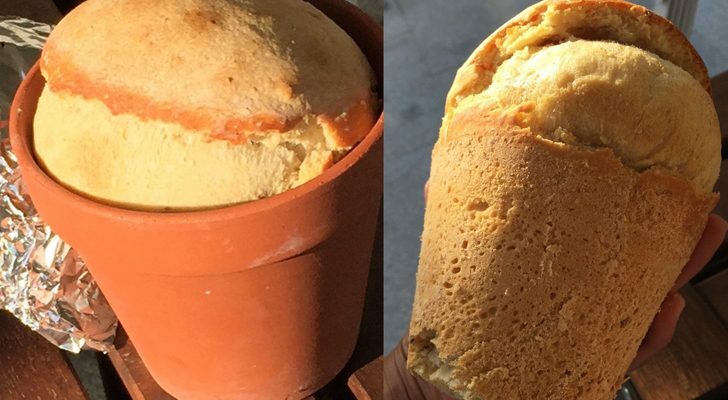 Here is a picture of what I think he means although this person has it sitting on shelf. I imagine he would like to attach the mount to the shelf and then a larger tv to the mount that would be outside the cabinet maybe? We are happy to offer help where we can if you are working on a project. The trouble is, we are having trouble understanding your question. Could you perhaps give us a little more detail so we offer some ideas? yes. don’t understand your site but am ;rekllplaceing the old tv in the over head cabinte with a 26y flat screen tv. Need to mount it on a stand on the floor inside the cabint? appriciate you shining some light on the subject. Looking forward to the installation portion.